Sanjeev Bikhchandani likes bird watching. At least once a year, India’s Web-business veteran hits the road to the famous Bharatpur bird sanctuary in Rajasthan, a six-hour drive from New Delhi. Armed with a camera and binoculars, he typically spends hours observing birds and marking out the exotic ones. As bird experts know, without the ability to wait out, the search for that exotic specie can become a frustrating one. But patience is something that 46-year-old Bikhchandani does not lack. Of late, the bird watcher’s patience is being employed in looking for a different species. The founder of India’s most successful portal company, Info Edge, is busy looking for Web entrepreneurs. Ones with exciting ideas that have the promise to become the next naukri.com, Info Edge’s flagship portal that is also the most profitable one in India’s online industry. With a chance to be mentored (and financed) by the master entrepreneur himself, scores of would-be entrepreneurs have sent in business plans. But Bikhchandani is careful, and closely studies each entrepreneur and every business plan. “I am looking for commitment in the entrepreneur. Does he have the ability to stick on when the times are not good?” Bikhchandani wants to know the team behind the entrepreneur, the space where the start-up will operate, and about the competition. But Bikhchandani believes there are more naukri.coms in the making. “I understand it is about having patience… to zero-in on an entrepreneur, for an idea to succeed and for it to become a profitable business,” he says, adding that he goes through “50 to 100 business plans” to shortlist one. The idea to invest in start-ups cropped up when Info Edge got listed on the Bombay Stock Exchange in 2006 and raised Rs. 170 crore. But it was not until 2010, says Bikhchandani, “that we became more serious about our strategy”. This financial year alone, till June 2011, Info Edge has invested in three new start-ups, building a portfolio of six companies with a total investment of about Rs. 80 crore, a significant amount for a company that clocked Rs. 293 crore in revenues in the year ending March 31, 2011. Thirteen years after founding Info Edge, last year, Bikhchandani vacated the position of managing director and CEO and asked his long-time associate Hitesh Oberoi to take over. Another senior colleague and Info Edge’s chief financial officer Ambarish Raghuvanshi additionally became group president – finance. In official jargon, Bikhchandani now focusses “primarily on strategic matters, investments and acquisitions”. He has Rs. 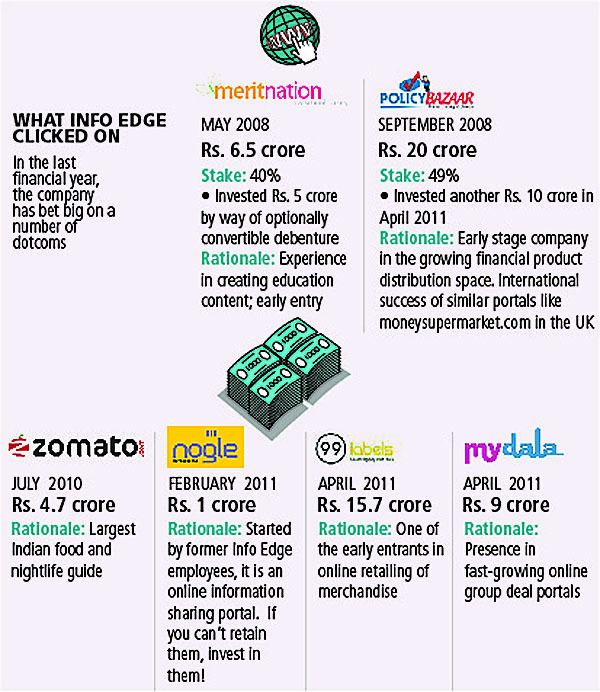 450 crore of Info Edge’s cash reserves in his hands, thanks to the profitable operations of naukri.com. The high profitability has also made the company a darling among investors, with a valuation that is 45 times its price-earnings ratio and a market capitalisation of Rs. 3,800 crore. With 43.24 percent of the company’s shares, Bikhchandani is now a millionaire many times over. But he is clear that not all of the cash will be used for strategic stakes. “About Rs. 90 crore [consists of] advances from our clients that we do not touch. Then, I prefer to put aside 15 months of working capital, about Rs. 150 crore, in case of an emergency.” So that leaves Rs. 200 crore for Info Edge’s expansion plan. However, the healthy financial position raises a pertinent question: Is the new strategy a needless risk that could turn disruptive for Info Edge? Especially since Info Edge’s business, despite its presence across four segments of jobs, real estate, matrimony and education, still revolves around naukri.com. The job portal clocked 80 percent of Info Edge’s 2011 revenues. Sure, 99acres.com, the real estate portal, turned black in the January-March quarter of 2011, but increased competition might see added spends hurting profitability. While matrimony portal jeevansathi.com remains a laggard behind bharatmatrimony.com and shaadi.com, the education vertical shikshaa.com is still in the ‘investment stage’. And brijj.com, Info Edge’s answer to LinkedIn’s growing influence in the job market, “is challenged”, admits Bikhchandani. So, each of these businesses still needs a lot of attention and capital to grow. Moreover, the change in Info Edge’s profile by taking on the venture capitalist form, will put it under more scrutiny. “Pure play venture capitalists use private money to invest and sit on an investment for up to five or six years before thinking of returns. But Info Edge is publicly listed and would be under more pressure to show returns from its investments,” says Alok Mittal, managing director of venture capital firm Canaan Partners, who earlier founded jobsahead.com. Canaan has invested in bharatmatrimony.com. The failure of Info Edge’s first investment in education start-up studyplaces.com adds to the question marks. After investing Rs. 4 crore in the company in 2007, Info Edge exited two years later through a distress sale of studyplaces.com to Educomp Solutions. It hardly recovered its investment. “It is a risk,” admits Bikhchandani. “Though we want each of these companies to succeed, it might not turn out to be so. But looking at the investments that we have done till now, I am confident,” he adds. Hitesh Oberoi agrees that it is the right strategy. “Internet penetration in India is growing and many new opportunities are coming up. It is not always possible for us to start new businesses by ourselves.” The last Web service Info Edge launched was in education, shikshaa.com, two years ago. As online traffic increases, “we want to expand our presence in the consumer Internet space and make Info Edge the biggest in it,” says Bikhchandani. Looking around India’s portal industry, Bikhchandani would have reasons to believe that he is on the right path. A lot has changed since he launched naukri.com out of a garage in east Delhi. At that time, in 1997, India had 14,000 registered Internet connections. Money was scarce and Bikhchandani went without a salary for the first six years of Info Edge. The struggling years also forced him to double up as a management teacher and consultant at newspaper Pioneer to make some “extra money”. But conditions favoured naukri.com. It had a three year lead over its closest competition and the product catered to a pressing need in a growing economy. The conditions couldn’t be more different today. India has about 1 million connections and 100 million users. The number of users is expected to jump to nearly 250 million by 2015. The next-generation entrepreneurs have also evolved. “Today’s entrepreneurs plan better and have well thought-out business plans to implement their ideas,” says Ashish Gupta, a former entrepreneur-turned-venture capitalist at Helion Venture Partners and also a board member at Info Edge. With new portals backed by aggressive entrepreneurs mushrooming fast around him — 20 new portals have been launched in e-commerce this year itself — Bikhchandani realised he needed to move quickly to get a slice of the fast-growing industry. “Good ideas can come from anywhere, from inside or outside. And many a time, even if we like an idea, we may not be able to work on it,” he says. The big handicap was shortage of management bandwidth. “At Info Edge, we are totally occupied in managing the present business. Adding more verticals will stretch management capabilities very thin,” says Raghuvanshi. It was a hurdle that Internet company Consim Info’s CEO Murugavel Janakiraman, who founded bharatmatrimony.com, faced when he expanded his business to jobs and real estate segments. It forced him to rethink and the new portals have now taken a back seat. He, however, squashes the idea that Consim is short of capital and is looking for more financing. There’s another problem that dogs the industry. Though there are many more venture capitalists and private equity funds available to be tapped, starting a portal is an expensive option. It took Rs. 40 crore and five years for 99acres.com to bring in its first profitable quarter. So, acquisitions is the next best option for Bikhchandani. Before the Info Edge founder could go ahead with the new strategy, he also had to convince the board. “We had doubts and I was initially opposed to it,” says Gupta. His main concern was for Info Edge itself. Would the core business suffer if the attention was diverted to the new venture capital strategy? To check that, there was a reshuffle of responsibilities within the company. Hitesh Oberoi and Ambarish Raghuvanshi took over the daily operations at Info Edge, so that Bikhchandani could devote his time to identifying investment targets. Bikhchandani also formed a team of five, including Oberoi and Raghuvanshi, who would discuss the investment proposals before taking them to the board. New concerns cropped up when the studyplaces.com investment flopped. “But we took it as a lesson,” says Raghuvanshi. So, while Info Edge was one of the minority shareholders in studyplaces.com, it has made sure to take a larger chunk in later investments. “Fewer shareholders means more freedom for the entrepreneur to function and less time wasted in clearing and clarifying on each step,” adds Oberoi. Now with Info Edge taking over 40 percent stake in each of its later investments, including in meritnation.com and policybazaar.com, Bikhchandani also has more say in their operations. But he is careful not to interfere too much. “If I do that, I take away the excitement of being an entrepreneur. We have scheduled reviews with each of the companies. Other than that, I have regular conversations with the entrepreneur on a weekly or monthly basis, especially when he seeks me out,” says Bikhchandani. Pavan Chauhan, founder of meritnation.com agrees that Bikhchandani has hit the right note. After passing out from IIM-Bangalore, Chauhan turned entrepreneur after three years in a regular corporate job. “I wanted to get into the school segment and had a business model. But had no idea about how to create a Web portal,” he says. That is when a chance meeting with Bikhchandani, whom he had met quite often earlier, got the Info Edge founder interested in Chauhan’s business plan. The Web veteran brought in his expertise in building a Web business and also his cash reserve, taking 40 percent stake in Chauhan’s start-up for Rs. 6.5 crore in 2008. When Bikhchandani invested again for another 8 percent two years later for Rs. 5 crore, “it was a natural progress in Info Edge’s involvement in meritnation.com. I didn’t even think about going to another person or seeking another opinion on the valuation,” says Chauhan. Apart from sharing expertise on building and monetising Web portals, Chauhan also uses Info Edge’s experience in building an organisation. This is a template, reiterates Bikhchandani, which is open to other entrepreneurs too. The corridors of Info Edge are abuzz with many more investment announcements that are in the offing. As for Bikhchandani, the bird watching will continue for sometime, albeit not in Bharatpur.